That mendacity has long been a bedrock of government makes Bovard (Lost Rights; The Bush Betrayal) mad as hell, and he takes administrations from Johnson's to Bush II's to task for distorting, concealing and fabricating facts and condemning voices of dissent as unpatriotic and damaging to democracy. Bovard places past and current administrations' justifications for military actions (Johnson in Vietnam, Reagan in Iran, Bush I in Kuwait, Clinton in the Balkans and Bush II in Iraq) alongside the facts of each case, an approach that benefits greatly from hindsight and serves to insulate his argument from partisan criticism. Clearly, it's government, not the liberals or conservatives who man the helm for any period of time. Government, though, can only be as crooked as the public and media allow it to be, Bovard argues, decrying voters who vote for a candidate because he ""wears a cowboy hat"" and the media for not being vigilant enough in calling out wayward politicians. 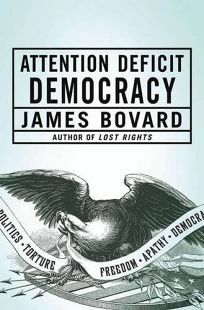 Bovard describes problems in painstaking detail, but he is less adept at offering solutions, blandly encouraging Americans to cultivate ""a higher grade of patriotism."" Readers up-to-date on the headlines will learn little, but those looking for a rousing refresher on the merits of skepticism will find it here in spades.